Model #: HP10024D Click to view the whole line. This 10000 watt 24 volt to 120/240vac pure sine wave inverter charger is a combination of 10KW power inverter, 150A battery charger and AC auto-transfer switch with a peak DC to AC conversion efficiency of 90%. Yes, you didn’t get it wrong, this transformer based 10KW inverter works with 24Vdc input !!! 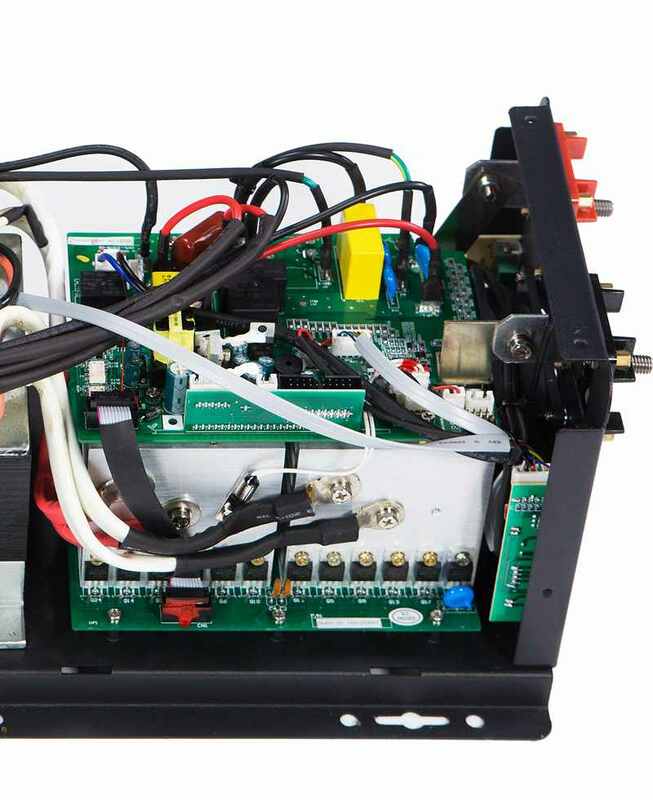 The 10000 watt 24 volt to 120/240Volt transformer inverter charger was crafted by Sigineer Power’s insane engineers with great care. No other inverter manufacturer has ever launched such a model. Over the years, Sigineer customers have been asking for a 10KW inverter charger with 24Vdc input. It is easy to do on the high frequency platform, but a pian when it comes to low frequency. As the enormous amount of DC input current goes to as high as 600 Amp, only the most efficient and robust power modules with do the tough job. This is a power package: 10KW power inverter, 150 amp 24Vdc battery charger and 83A transfer switch. Unlike other 10000 watts models which are usually with DC input voltage at 96Vdc or higher, our 24 volt DC input is much safer when it comes to electrical safety, and the 24 volt simplifies battery bank configuration and complies with a wider range of solar chargers when the inverter is integrated into solar systems. This split phase inverter charger takes 240Vac input (two hot lines of 120Vac each in split phase area or 240Vac single phase) and outputs 120Vac or 240Vac at 50 or 60Hz as per the setting of SW4 DIP switch. The output voltage can also be calibrated to 220Vac or 230Vac in factory, so the inverter is actually operable in the majority electrical systems in the world. This high power inverter is great for emergency backup power, renewable energy, hunting cabin or off-grid vacation home as it gives you access to 10000 watts of continuous power and 30,000 watts of surge power (to 20 seconds) when a power outage occurs. This top-of-the-line high power inverter with built with latest DC-to-AC inverter technology, it performs with very high Dc to AC efficiency of 90%, 150 watt idle consumption, sharply lower than that of competing models. Under full linear load, there is a max 10% THD at nominal battery voltage(24Vdc) and max 20% THD at low battery voltage cut off point(20Vdc). It’s also built to work in harsh conditions with fluctuating voltage, heat and temperature. And it’s protected from humidity or dust and dirt thanks to its marine-coated or “conformal-coated” boards. This inverter provides the reliability for business or residential emergency backup power systems. The unit is easily repairable with simple component replacements.